This fabulous statue was accenting the downtown sidewalk of Sioux Falls, SD. Thanks to my uncle for stopping in the middle of traffic for me. I love my cat. I can't have a dog, so I have trained my cat to act like a dog. I am a bad trainer. He is smart. He knows my schedule better than my own mother. When I open the door to my abode he darts between my legs in a mad dash for the hallway. I (he just ran over my head)think he might be lonely, so I have been contemplating another adoption. The only thing I am fearful of is that I'll be classified as a cat-lady. I haven't reached crazy status, but I certainly don't want to be that person. You know, the one that has more cat hair on her pants than on her own head. Yeah, that one. I can't think of anything entertaining to blog about. Do you want to share some inspiration with me? I'd much appreciate it. I miss the long standing family tradition of eating as many Pronto Pups as the stomach can handle during summer vacations in Grand Haven, Michigan. On top of juggling a few too many pups in your hands you can enjoy this beautiful area with a walk on the pier. There is nothing comparable to the fresh lake breeze either. Pronto Pups are these tasty deep fried dogs that come either naked or with ketchup or mustard. That is it. Whoever came up with this concept 61 years ago is genius. Whoever wishes to join on my Pronto Pup run, please let me know. It will entirely be worth our time. Now, if you can't make it to Grand Haven, you could certainly try making these at home. If you do, I need to know how they turn out. Combine eggs and milk; add dry ingredients to form batter. Heat wieners in boiling water; dry. Insert wooden meat skewer into each wiener. Dip wiener into batter, fry in deep oil at 375 degrees. Yield 12 servings. Welcome to 342L: Laboratory in Basic Visual Principles. I am currently taking a couple of summer classes, so I chose to finally take subjects that peaked my interest. 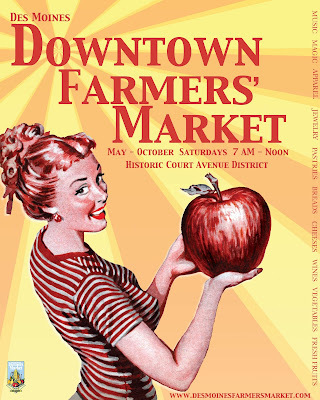 My first creative project is a 16X20" poster for the Des Moines, Iowa Farmers' Market. If you are interested in ever visiting the midwest, farmers' markets are about as Iowa as one can get. Think back at least a decade. How inviting while at the same time overwhelming was the cosmetics aisle of Walgreens or Target? Remember when it was okay to buy your makeup at the grocery store? How long has it been since your first experience with make-up? Most likely you were like me, completely oblivious to style. Purple cream eye shadow (not the tasteful type), too orange of foundation, hot pink gloss and cheap mascara. Cheap mascara you say? Of course. I have long since forgotten the days of purchasing cosmetics from the array of choices in the beauty aisles, but last night I ventured up and down the aisles of the local Target in search of something special. What I found was better than I could have expected. 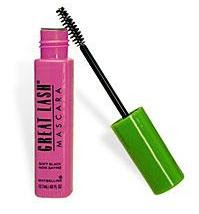 You all remember the plush pink tube of mascara with the neon green lid? That is right. Maybelline Great Lash Mascara. America's #1 selling mascara, according to Maybelline.com. Oh, this little tube of $3.99 goodness has made this make-up aficionado very happy. I forget how wonderful simplicity is. At first the wand felt too tiny. Compared to the other mascaras I have been using, the brush was a tad on the limp side. Since I typically pay upwards of $14.o0 for a tube of black goo that inevitably ends up boring me within weeks, I've tried a lot. For the most part I haven't been as pleased as I feel I should be with such an expensive splurge. Not so with this little gem. I opened the tub up this morning. Now for the tru e test. I've always been leery of waterproof anything on my face, but since it is raining in Ames today I a m going to give this bad boy a go. I think I am going to be pleasantly pleased. I'm a twenty-something college student at Iowa State University. I'm close to finishing up my final semester with a major in Advertising, and I am looking forward to gracing the working world with my presence.